WRISTBANDS SAVE LIVES. WILL YOURS? 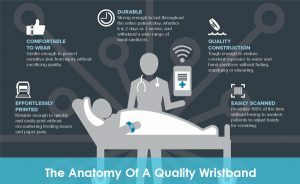 Patient wristbands are the foundation for a safer, more efficient process for delivering care. 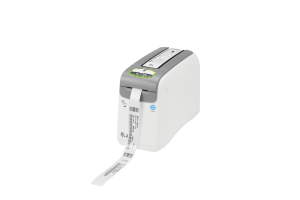 The ZD510-HC Wristband Printing solution combines the reliable ZD510-HC printer with easy-to-load cartridges containing the only antimicrobial-coated wristbands on the market – Zebra’s Z-Band® wristbands. Offering comprehensive connectivity options, a disinfectant-ready UV-resistant housing and the powerful Print DNA suite of applications, utilities and developer tools, the ZD510-HC increases staff productivity and patient safety. Also capable of printing wristbands for amusement, water-park and entertainment applications, the ZD510-HC is the industry’s easiest to use and most dependable wristband printing solution. The ZD510-HC is the easiest wristband printer to use on the market. Just insert the wristband cartridge containing Zebra Z-Band wristbands and print. The printer instantly identifies the wristband size and automatically configures darkness and speed settings for optimal print quality. Designed, produced and rigorously pre-tested, you get optimum image durability and scanning performance with Z-Band wristbands. They are resistant to hand sanitizers and are available in a variety of sizes, softness levels and colors. The ZD510-HC printer’s disinfectant ready UV-resistant housing is designed to handle regular sanitizing with harsh chemicals and UV light, helping prevent the spread of germs and increase patient safety.